Jeff worked for BMW dealerships across Maryland for nearly 20 years. He received unparalleled technical training and was among the most successful BMW master technicians in the US. But years ago the owner of a dealership Jeff was working for retired. Jeff decided rather than changing dealerships it was time to go out on his own, resulting in the creation of Francis Automotive Inc. Now 10 years later Francis Automotive is one of Westminster's leading shops. Michelle is co-owner of Francis Automotive Inc and handles all the phone calls, scheduling, emails, parts orders and anything else to go through the office. Michelle has been surrounded by cars all her life with her father being a car enthusiast. Michelle is the reason Jeff began to drag race. This past experience has given Michelle extraordinary talent when it comes to diagnosing a car before Jeff even hears about it. My mama is talented! 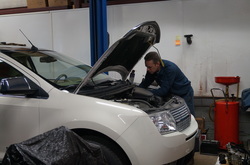 Cole is ASE Certified Technician who has successfully completed the CCTC auto tech program. Cole also has worked on cars since he was in his diapers and loves spending time with his father working on cars. Working side-by-side all of the Francis family will make your experience at Francis Automotive an unforgettable experience.